The existing Code area is already a convenient tool when it comes to editing script in global and schema (type) methods. But we felt that one has to jump between the Code and the Schema area a tad too often when doing real-world data modeling and code editing. So we decided to extend the Code area by taking over and extending functionality from the Schema tool while at the same time introducing additional functions for modifying types, their attributes and views. 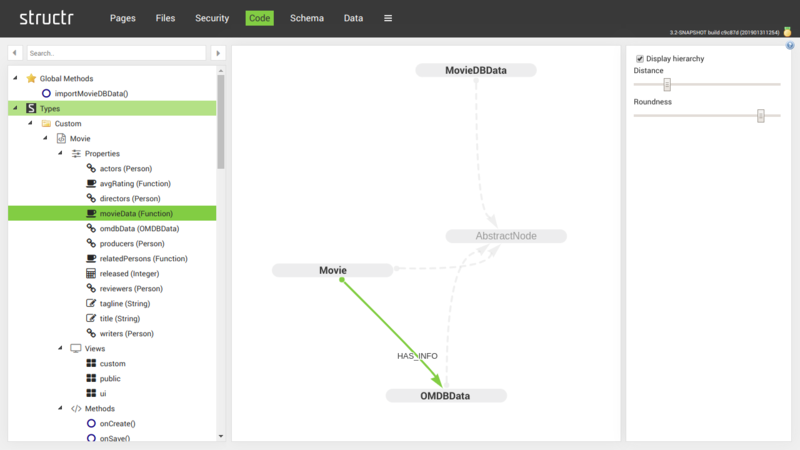 As we're more and more hitting the limits of the existing graph visualization in the old Schema area, we also decided to create a new data model visualization based on a different graph viz library which allows not only for better layouting but also displaying additional relationships between the types. So instead of only showing the entity relations between the types you can now also see the inheritance relationships in the same graph view. Navigation in the types tree will also be enhanced: When clicking on a type, the graph view will center the data model automatically so you can see the relevant sub graph at a glance. Last but not least we'll add a nice type-ahead style fulltext search with history list that brings you to the exact place you we're looking for.